Chinese Wushu & Taichi Academy LLC hosted Grandmaster Chen Zhenglei's 2016 "The Light of Taichi" Summer Camp. Practice the ancient Chinese tradition of Taichi – an art of embracing the mind, body and spirit, as well as graceful motion and balance – below the 100-foot suspended sculpture in the Glasshouse at Chihuly Garden and Glass. Taichi is a unique low-impact exercise involving minimal stress on muscles and joints, which makes it approachable for all ages and fitness levels. Class will be led by Master Yi Jiao Hong of the Chinese Wushu & Taichi Academy in Seattle, who will teach proper posture and body movements, plus how to keep your body feeling open and relaxed. Designed for all levels, this 60-minute session will help you start your day with positivity and inspiration. Space is limited. Gallery admission after class is included with this ticket. Tickets must be purchased online prior to the event. $26 (+tax) per person, each class. Register online at Chihuly Garden and Glass. Free for Foundation Members, RSVP with programs@chihulygardenandglass.com. Welcome to Yijiao Hong's taichi class! Begin a lifelong journey of destressing through correct body posture, authentic Taichi moves, and slow, even and deeper breaths to a calm mind and better health. Have fun with Chinese cultural experiences too! Master Hong will give in-depth, step-by-step instruction on authentic Yang and Chen Taichi movements and Qigong warm-ups from Traditional Chinese Medicine, using the latest in physical learning science. 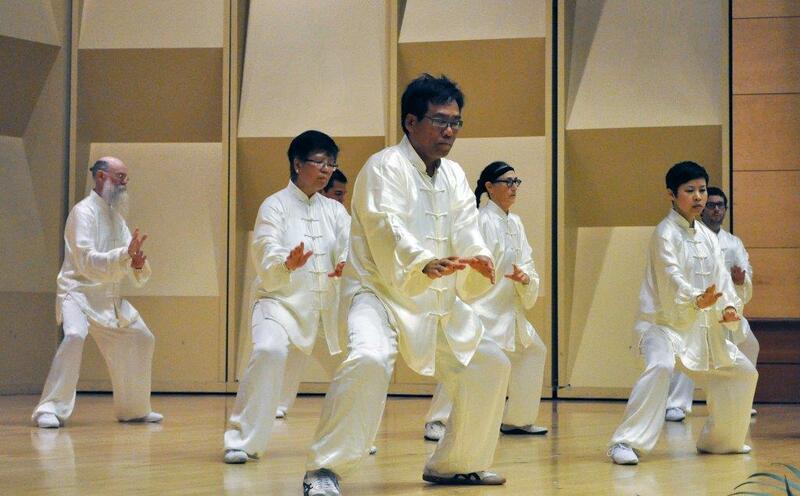 Master Hong will also talk about how Taichi originated from ancient Chinese philosophy, Chinese medicine and Qigong. The beginning class will emphasize the skills of self-centering, body relaxation, and slow breathing while practicing form movements. You can expect increased flexibility, leg strength, coordination, and balance, as well as learning to be relaxed in an energetic way. Taichi is an ideal aerobic exercise for life time. Do you know that practicing Taichi maintains spine health and increases bone density? It is beneficial to the cardio-vascular, respiratory, and nervous systems, digestive system, balance and also improves circulation of Chi. Master Hong's long-term Taichi students report that practicing Taichi helps alleviate hypertension, asthma, knee pain, and stress, while also improving mental, body strength and overall happiness. Fill in the registration form and make your check payable to CWTALLC. Learn and review Yang Style Taichi 24 Forms from international Taichi Grand Champion Yijiao Hong. Born in Jin Hua, China, Master Hong started practicing Wushu with the Jin Hua Wu Shu Team when she was 8 years old. She was the top Wushu athlete and Taichi champion in Zhe Jiang province, China. Master Hong has a B.A. degree in physical education in Wushu and Taichi from Zhejiang Normal University, China. She became an assistant professor and team coach of Zhejiang College of Traditional Chinese Medicine in 1992. She coached the college Wushu and Taichi Team and competed in China national tournaments until she immigrated to Seattle, U.S. in 1994. Master Hong was named U.S. "Year of the Athlete" by USAWKF in 1998, and competed on the U.S.A National Wushu Team in the 5th World Wushu championship in Hong Kong in 1999, where she ranked 7th among the top world professional Taichi athletes. In 2000, Master Hong was certified by the International Wushu Federation in Beijing, China as a Wushu International Judge. In 2004, Master Hong earned the highest rank as a Wushu International A Grade Judge in Beijing. Between 1999 and 2003, she judged for selection of National Wushu Teams for both the U. S. A. and Canada. Master Hong's passion in Taichi originated from her late teenage years at University, especially after she studied Chinese Medicine for two years and visited Madam Chen Lixing in Xian, China Master Hong's strong belief in Taichi's therapeutic value in life and Taichi's powerful martial application is a constant source of inspiration for her. Master Hong is a lifetime student of Taichi Yang family from Grandmaster Fu Shengyuan and Chen family from Grandmaster Chen Zhenglei, Chen village, China. Currently, Master Hong is focused on teaching Taichi. In addition, she practices Guzheng (an ancient string instrument), and enjoys traveling around world with family to experience worldwide different culture. CWTA LLC has three elements that make it a great place to study and practice. Most importantly, Shifu Hong is a wonderful combination of patience, knowledge and competence. Secondly, we have a great connection with Chen Grandmaster Chen Zhenglei who is an absolute treasure to the world Taichi community. Last but not least, the people who study here are really fun people who I am proud to have as friends. Yijiao Hong is an inspirational martial artist and a wonderful instructor. Her students can always rely on her commitment, dedication and thorough instruction. The school offers diverse styles and many unique experiences as well as opportunities to train with world renowned masters. I wanted to learn Chen Style with one of its grand masters, Chen Zhenglei. Shifu Hong helped me begin learning the basic form in preparation for a seminar with Master Chen. Ever since that, I have benefitted greatly from Shifu and the teaching assistants. Shifu is good hearted and genuinely cares about her students' progress from week to week and year to year. She is constantly working on her own practice and very generous in sharing her own learning from Grand Master Chen with us. It is fun to try to drop all my mental concerns and put my mind in my body to try to really feel the movements. Taichi has also helped over the years with knee pain from a long ago knee surgery.